The BBC cancelled Ripper Street last year due to poor ratings but there will be a third season after all. Amazon has partnered with the BBC to revive the period crime drama. Filming of season three will begin in May. The new season will be offered exclusively in the UK on Prime Instant Video before screening on BBC1 a few months later. Amazon’s service will also stream the first two seasons. The show airs on BBC America here in the States. The second season began airing on February 22nd. Based on the press release, I suspect that season three will be made available on Amazon first and will then be aired on BBC America. I’m sure additional details will be released in the future. 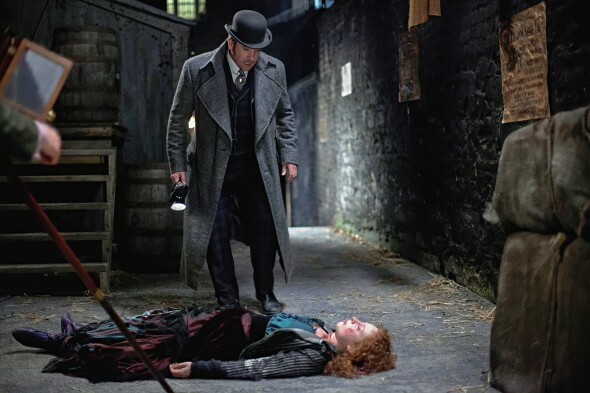 Amazon will commission from the producers, Tiger Aspect Productions and Lookout Point, a third series of Ripper Street, with brand new episodes made available exclusively to Amazon Prime Instant Video members. The series will continue to be co-produced in the US by BBC America and will screen on BBC1 a few months after it is available on Amazon in the UK. It will be distributed globally by BBC Worldwide. Filming will begin in May 2014, signaling Amazon’s commitment to the production of one of last year’s most highly regarded series, in a move that is sure to delight Ripper Street’s huge global fan base. What do you think? Are you glad to hear that Ripper Street has been revived? Will you watch on Amazon’s player or wait for it to become available elsewhere? I’m searching (perhaps in vain? ), for a date that Ripper Street will air on the BBC in 2015. Anybody? I love this show…hard to find anywhere I bought first and second season from Amazon if the have season three available I will buy it also. I love the BBC shows! How many episodes were there in the first season of Ripper Street. I would love to see season 2 and I am thrilled there is a season 3. I love all British detective shows and mysteries. let me know when MacFayden’s ripper season three will start. please I love his acting and the show. I hope they will bring back ripper street on BBC soon as they can. Love this show. I also loved Copper very much also. wish they would bring that back too. I discovered Ripper Sreet at Costco. I purchased season one & two on DVD. I went on the internet to try and find out if it is going to be shown on BBC America.From what I just read, I think it will. I just need to find out now what dates it will be shown. Who are the THEY PEOPLE rating shows? What are they basing their opinions on those stupid reality shows? How come you never use people like me for ratings. This is one of the best TEN shows on air. You tv people waste a lot a lot of $$$ on producing nonscence. I’ll sign up for Amazom Prime. I just have figure out how. Ripper Street is a great show. My sincerest thanks! i subscribed to amazon prime as soon as i heard the news———-thank you amazon. Love Ripper Street – like the story line and characters. Please keep it on. Great news – Season 3 for Ripper Street. Thankful BBC America will be showing Season 3 of this wonderfullly written series with it amazingly talented actors. i am thrilled it is coming back, it was such a thriller. Someway along the line I did miss a few, is it possible that there is a way one is able to see the first ones right up to the new series??????????? I don’t have access to cable where I live, so I watch all my programs on solarmovie. They have back seasons, even very old shows, as well as current. Good community of folks. Really? They bring back Ripper Street but not Copper…really? Copper was a much better show! Seriously, I’m never watching anything on BBC America again (I stopped watching that channel after Copper’s cancellation anyway). I agree, Copper is such a good historical drama of early New York. I wish Amazon or Netflix would also pick up Copper. I think both shows are outstanding, and love historical dramas.